Cytoscape allows for merging of both network and table data, through Tools → Merge. The Advanced Network Merge interface is available from Tools → Merge → Networks… and allows for merging of two or more networks. With the buttons select either “union”, “intersection” or “difference”. Networks available for merge are listed under Networks to merge. Select a network from the list and click the right arrow to transfer the network to Selected networks. Click Merge to continue. The merged network will be displayed as a separate network. 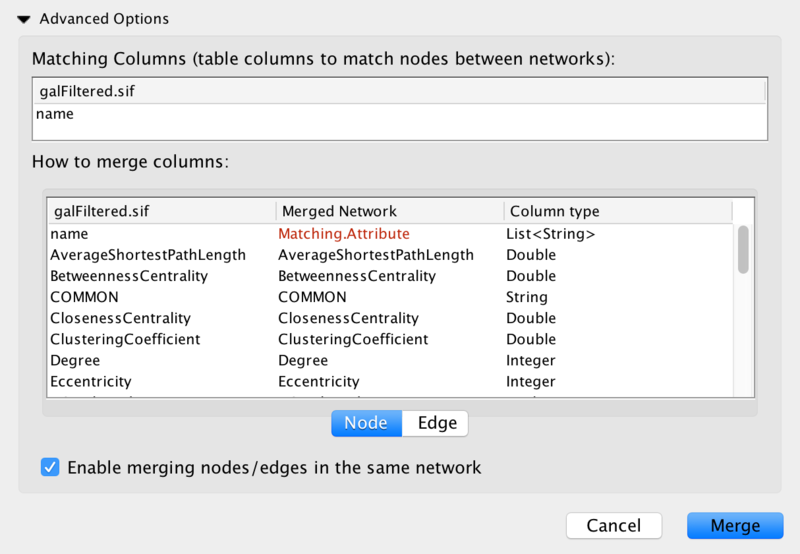 Matching columns: This specifies the network columns that should be used for merging. Typically, the “name” column or some other column containing identifier information is used here. How to merge columns? : A table lets the user specify for each of the individual network columns, what the corresponding column in the merged network should be named and its data type.